Student Saiman Miah has achieved his part in the 2012 Olympics legacy after his design was chosen for one of the official £5 coins for the London Games. The 24-year-old won a student competition run by the Royal Mint, to see his design on the Olympic coin while Pippa Sanderson will see her design on the Parlympic coin. 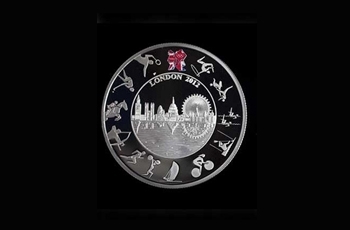 Miah said his love of architecture spurred on his design for the Olympic coin which includes a detailed sweep of London’s skyline and pictograms of athletes running around the edge. “I wanted a classical design that represented old traditional British values. London 2012 is very contemporary so I have merged the old and new together with the classic London landmarks such as Big Ben and St Paul’s with the pictograms of the Olympic sports on the outer edge. I am very proud to be involved in both Olympic and British legacy. The coins are part of the summer Olympic tradition which dates back to the 1952 Helsinki Games and will go on sale later this month. The first Olympic coins can be traced back to 480BC and were introduced as souvenirs by the ancient Greeks.